Obviously your stag weekend is a massive deal right? Which is why you will want it to stand out from all your previous nights out and any other stag do you have been on. When thinking of stag do’s something that automatically springs to mind is fancy dress right? A theme for your stag do is the best way to make your night or day stand out and will be something that will make you and all the lads remember for months after. Stag do themes have become very popular over the past years and what better way of getting all the lads involved then a fancy dress theme. For one night only why not bring back the classic themed children’s birthday party from when you were 5 years old. 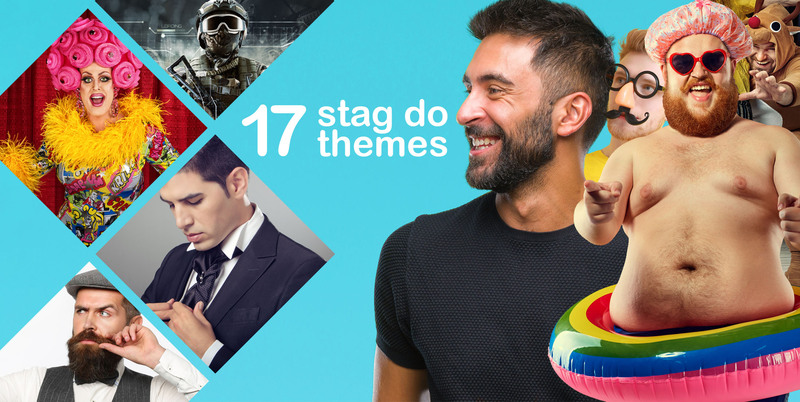 There’s endless amounts of ideas for what to choose for your theme but to help we have found the stag do themes of 2018. Firstly, you could consider a traditional theme. This would be a more sophisticated attire for those who like to get suited and booted and is why it is one of the most popular stag do themes. Depending on what you’re doing as your stag do you could link in anything from an array of James Bond style suits to tuxedos or even a smart tweed suit! Most lads love the opportunity to get suited and booted and a stag weekend is the perfect excuse for this! Here’s one for those who like to have a laugh with their choice of clothing. An action themed choice might be perfect for you especially if you have an action packed stag do weekend. And of course, an action packed weekend would mean more practical clothing. The best outfit which is action based and also practical would obviously be army gear. This would be amazing if you’re activity of choice is one where your running about and getting down and dirty! And if you’re the active kind of guy who loves his sport then your activity of choice is of course going to be sporty too, no? It would make total sense to have a sports theme. This theme is so vague so you and the rest of your friends can mix and match all different types of sports! Obviously if you’re playing football then it would make sense to dress in football attire unless you want to really mix things up and wear golf clothes to play. No matter what sports you choose to go for this theme would have to be the easiest fancy dress theme for everyone involved in the stag do celebrations. Simple but effective, and a great way to prank the soon to be wed. Get all of the lads to dress up as the stag, whether that be you all wear the awful shirt he wears every night out. Or the embarrassing outfit he pulled out back in high school or stitch him up by wearing the football kit of the team he hates. Whatever you decide this is an easy way to throw a theme into the weekend without dressing up too much. Finally, before deciding on your chosen theme it’s probably a good idea to check if your chosen venue has a dress code (if you’re going to town after your activity in the day). The last thing you want on your big night is to turn up dressed like an army man or a footballer and getting turned down.